Just in time for the last weekend of the summer, I want to share a delicious drink that we’ve been enjoying for the last few months…Basil Lemonade. This summer, I planted an herb garden. It’s the coolest thing! 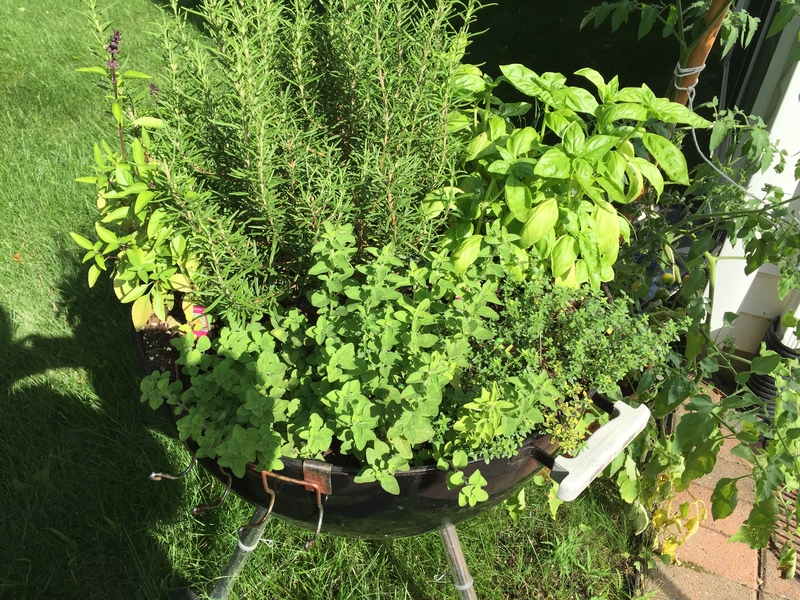 We used an old Webber Grill that had been designated for dumpster day and filled it with rosemary, oregano, lemon thyme, chives, thai basil, and sweet basil. Yes, I was feeling all kinds of Martha Stewart-ish about my project and being able to clip fresh herbs for cooking! My herb garden, planted inside an unused Webber Grill. I’d also purchased a wonderful cookbook, “It Ain’t Sauce, It’s Gravy!” by Steve Martorano. * Well, he has a recipe for Tuscan Lemonade that I tried. While his Tuscan Lemonade is full of liquor and is kinds of delicious, it’s not actually lemonade. 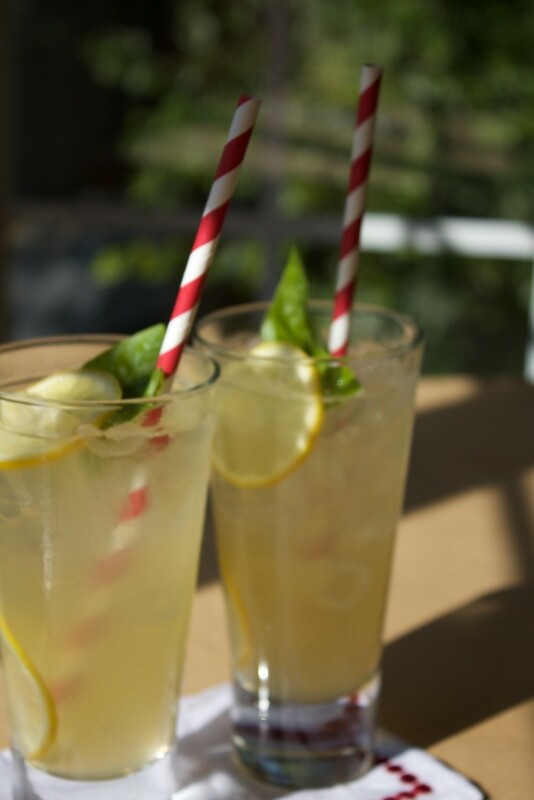 His use of basil in this drink did give me the idea to try basil in my lemonade, just like using mint leaves in tea. This Basil Lemonade has been an evening staple for us this summer. 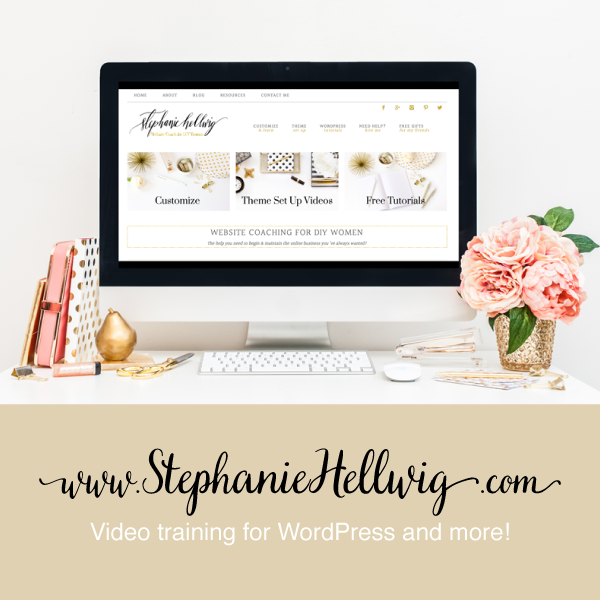 The herb garden that I planted could barely keep up with the demand! I am not being compensated in any way for the book referenced in my post. I further do not disclaim that I have enjoyed this beverage on numerous occasions with the addition of vodka! Lemon & Basil go together like Peanut Butter & Jelly! Place basil leaves, honey, and boiling water in a bowl. Use the back of a spoon to bruise the leaves. Cover and allow to steep and cool to room temparture. 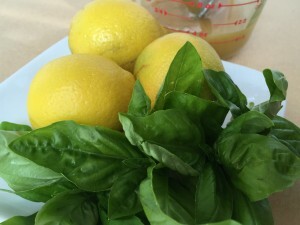 Strain the basil/honey mixture into a pitcher and add lemon juice and sparkling water. To serve, fill glasses with ice and lemon slices. Pour lemonade into glasses and garnish with a lemon slice and basil leaves.